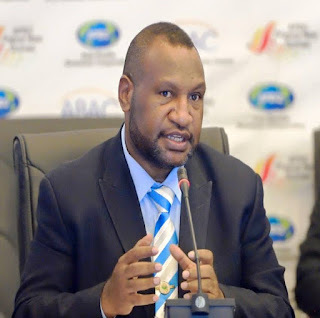 PNG Minister for Finance, James Marape , has labelled the latest economic claims by the opposition as blatant fake news and warned news organisations to fact check anything they receive from the Opposition. “The Opposition Leader is once again unable to understand basic trends and misrepresents the facts,” Mr Marape said after a news report was published on public sector wages. “What nonsense they are claiming of a blowout in public sector wages by K409 million. “The MYEFO shows that as of 30th June, public sector wages and salaries’ expenditure was K1,861.8 million compared with the full 2018 budget appropriation of K3,750.3 million and the 2017 outturn of K4,201.2 million. “Consequently, the public sector wage and salary bill over the first half of the year is running at exactly half of the 2018 budgeted appropriation which is clearly on track. Minister Marape said wage levels were carefully considered late last year during budget deliberations and a cautious path was chose considering the prevailing economic conditions at the time. “Expenditure was tightened and we did anticipate we could afford the 3% wage increase in 2018 and, and so, we did not include it in the budget. “The situation was made more difficult by the February earthquake. “However, the Leadership of our Government, the remedial measures undertaken post the earthquake by our leading companies, international partners, government entities and our public servants have resulted in an exceptional reconstruction effort and an early resumption of economic activity. “This has been now been confirmed in that we expect revenues to come in above budget by K213.1 million this year. “This is an exceptional achievement, given the severity of the earthquake and the disruption to our people’s lives. “I would be expecting a sensible and fair Opposition to be giving Credit to the Government Leadership rather than trying to discredit it. “With the increase in revenue and with the receipt of funds from Credit Suisse and budget support funds from the ADB, as well as the expected funds from the World Bank and inaugural bond issuance program, the Government has agreed that it can now afford to pay the 2017 3% increase in salaries and begin paying the 3% increase granted in 2018. “Our long-suffering public servants have had little increase in salaries over the past few years and have had to endure much longer hours dealing with the earthquake challenges and APEC preparations. “They deserve these increases and the Government can now afford to pay for the increases without increasing the budget deficit which is expected to come in on target. “So the opposition Leader’s claims of mismanagement are clearly wrong. “It is true, however, that despite outlays for public sector wages being 50% by mid-year, underlying total personnel emoluments are slightly more difficult than we had anticipated. “This has been an on-going challenge for all Governments, including when the Opposition Leader was Treasurer, but now we are making serious advances in dealing with the issue. “We are addressing the use of offline payment trends, including overtime, a good portion of which is through the continuing use of the inefficient PGAS system, which we are phasing out. “Whilst the wage increases, which are expected to cost the budget an extra K232.7 million in 2018, have been mostly covered by the expected increase in revenues, these other costs will need to be contained. Minister Marape said the Government has instructed its Organisational Staffing Personnel Emoluments Audit Committee (OSPEAC) and its Public Sector Organisational Reform Taskforce to introduce some hard budget ceilings for employment costs to address these cost of the public service and to bring this expenditure back on track. “This Government will not walk away from it responsibility for prudent fiscal control and management,” the Minister said. “I am very confident that the Government will end the fiscal 2018 year with its budget deficit intact and its debt to GDP ratio at 31.2 per cent, lower than the budget projection of 32.2 per cent. “We aim to better our Budget target not just meet them. “As to comparisons with private sector wages, our public sector workers have had to endure little growth in wages over a number of years and deserve to receive this modest increase. “The Government is working hard to lift private sector activity after the normal decline from the significant LNG construction boom, serious impacts from the drought, lower commodity prices in recent years and the February earthquake, all of which have hurt private sector activity. “Our Government has been tightening its fiscal belt at the same time to deal with the difficulties in the domestic debt and foreign exchange market. “This has also affected the private sector and adversely impacted employment levels. “But this Government is not walking away from our responsibilities. “We will not abandon our aspiration to ensure that our people are healthy, that our children are educated that they increasingly have access to basic infrastructure and that we provide opportunities to increase the quality of life for our people. “We are working hard to get the private sector moving again by investing in agriculture and assisting small business; investing in infrastructure; supporting the greater availability of finance to small scale operators; investing in other Petroleum projects and other mineral projects. “We are showcasing PNG to the world in the upcoming major APEC Summit. and we have re-engaged with the ADB and World Bank with both these respected institutions now providing low-cost budget support loans to PNG and we are about to issue the country’s inaugural sovereign bond. “These measures will solve the foreign exchange imbalance, stimulate domestic economic growth and drive much greater optimism in our people for the exciting period ahead.